Tim White was born in Canberra and grew up on Christmas Island. As a teenager he fell in love with The Beatles, got hooked on classical music and took up percussion, studying in Sydney, Denmark, Germany and the USA. Tim is the Co-ordinator of Classical Music and Senior Lecturer in Music at the WA Academy of Performing Arts at Edith Cowan University. He has led the percussion teaching programme at WAAPA since 1994, directs the award-winning ‘Defying Gravity’ percussion ensemble, lectures in the Art of Performance, co-ordinates all of WAAPA’s classical ensembles, and supervises postgraduate research students. In 2014 Tim won ECU’s 'Vice-Chancellor’s Award for Excellence in Teaching', and in 2015 he won the Australian Awards for University Teaching’s 'Award for Teaching Excellence'. Tim was Principal Percussionist of the West Australian Symphony Orchestra for 28 years, before moving fulltime to WAAPA in 2013. 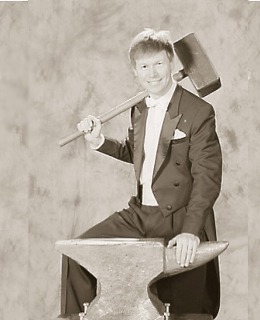 He was also Principal Percussionist of the Tasmanian Symphony Orchestra in 1984/85, and has performed with the Sydney Symphony Orchestra, Melbourne Symphony Orchestra, Singapore Symphony Orchestra, Adelaide Symphony Orchestra, Queensland Symphony Orchestra, Australian Opera and Ballet Orchestra, Orchestra Victoria and Australian Chamber Orchestra. Tim has toured Europe with the Australian Youth Orchestra, toured Germany as a soloist with the Hofer Symphoniker, performed solo for the Festival of Perth, and presented numerous percussion concerti as a soloist with the WASO and TSO. He presented the German and Australian premieres of Per Norgard’s ‘Percussion Concerto’ as well as the WA premieres of concertos by Richard Mills, Paul Creston and Darius Milhaud. Tim holds two Masters degrees in music performance, was awarded a Churchill Fellowship in 1999, and won a German Government DAAD Scholarship in 1991-93. He tutors regularly for the Australian Youth Orchestra and was Musical Director of the AYO’s 2010 National Music Camp. Tim is a guest tutor for the Australian National Academy of Music, and directed ANAM’s ‘Rhythms of Life’ percussion festival in 2003. Tim has performed with many of the world’s leading artists, including Luciano Pavarotti, Placido Domingo, Jose Carreras, Ray Charles, Dame Joan Sutherland, Dame Kiri Te Kanawa, Dame Evelyn Glennie, Vladimir Ashkenazy, Charles Dutoit, James Galway, Sumi Jo, Midori, Bryn Terfel, Joshua Bell, Nigel Kennedy, John Williams, Ben Folds, Chick Corea, Tim Minchin, Jon Lord, Glen Campbell, Dionne Warwick and John Farnham. Tim’s passion is the transformative power of music: exploring how its beauty and joy can reach out to touch souls, nurture imaginations, enrich lives and transform communities. Tim is a Senior Lecturer in Music at the WA Academy of Performing Arts at Edith Cowan University, where he leads the percussion department and directs WAAPA’s award-winning ‘Defying Gravity’ percussion ensemble. Percussion students come to WAAPA with dreams of making music their professional career – and Tim and WAAPA assist them to make their dreams come true. Percussionists studying with Tim receive individual lessons, participate in weekly percussion workshops and masterclasses, perform in ‘Defying Gravity’, and enjoy full access to WAAPA’s fabulous percussion facilities based around the Handa Percussion Studio and the Music Auditorium. WAAPA offers percussion students an extraordinary range of performance opportunities ranging from the Faith Court Orchestra, Symphonic Wind Ensemble and Brass Ensemble through to solo recitals, chamber music, new music groups, music theatre shows and the Indian Ocean Ensemble. Percussionists can enrol in a variety of music courses: a 1-year Diploma of Music, a 4-year Bachelor of Music degree, a 2-year Master of Music degree and a 4-year PhD. If you are interested in studying percussion at WAAPA, please contact Tim through the contact page. Since 1990, 57 of Tim’s students have been awarded Bachelor and/or Masters degrees in music performance and education. Forty-five of these students are currently working full-time as professional musicians, with established careers in the fields of music performance, education, composition, recording, production and arts administration – a graduate employment rate of 78%. Tim’s former students are now working around the world in settings ranging from the Cirque du Soleil through to Tetrafide Percussion, Synergy Percussion, the WA Symphony Orchestra, SSO, MSO, music theatre shows and the WA School of Instrumental Music. Euphina Yap (BMus) won the 2013 Edith Cowan University Medal, which is awarded to the top student in the entire University. In 2014, Euphina also won the inaugural Australian Marimba Competition. Twenty-one of the 23 freelance percussionists employed by the WA Symphony Orchestra are former students of Tim. Fiona Digney was the only student in 2013 and 2014 invited into the world’s leading PhD program for percussion – at the University of California at San Diego - having previously earned Masters degrees at the University of Alaska and the Rotterdam Conservatory. Thea Rossen, Kaylie Melville and Lara Wilson have all won fulltime places at the prestigious Australian National Academy of Music. Marcus Perrozzi has performed ‘Dralion’ with Cirque du Soleil more than 1,000 times over the past five years, touring to every continent on earth. Genevieve Wilkins performs in London’s West End and for the Royal Shakespeare Company at the Globe Theatre, is a member of UK’s ‘Ensemble Bash’, and teaches percussion at the Royal College of Music. 24 members of Defying Gravity performed at the official Opening Ceremony of the 2011 CHOGM meeting in Perth, before Queen Elizabeth II and a number of Prime Ministers from around the Commonwealth. Tegan LeBrun graduated from London's Royal Academy of Music in 2017 with a Masters degree in percussion performance, and won the RAM's prestigious 'James Blades Prize for Timpani'.